There are some important differences in the 12S socket wiring in caravans manufactured prior to 1999 and after 1999. The 12S cable sizes for post 1999 models have been increased to reduce voltage drop and improve load capacity. The car charge line (blue cable) is now left unused, the caravan battery is now charged via the green cable whilst the car engine is running, when the car is not running the green cable reverts to providing a power supply from the car battery, this action is produced from a relay fitted in the caravan. Also the fridge negative has been separated to reduce the loading on the system which unfortunately may cause compatibility issues with some older cars. 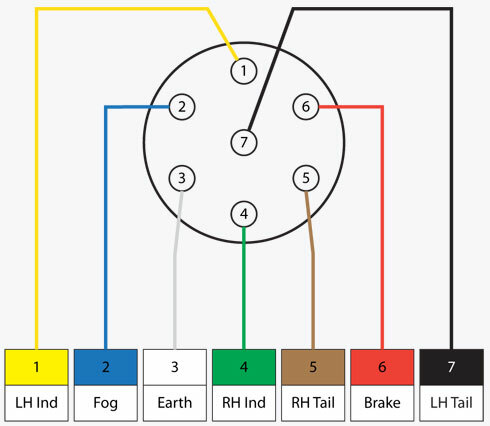 Please Note: That when wiring the 12S socket, independantly wire Pins 3 & 7 to the car. This increases the wire load capacity and prevents overheating. In the UK, trailer lights are normallly connected using a 7 pin plug and socket known as a type 12N. 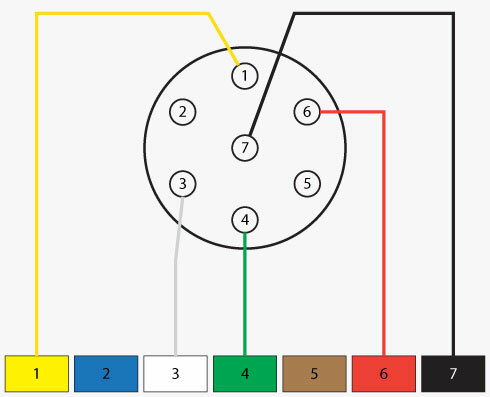 If you look at a socket or plug you should be able to see the pin lables (1-7). In some cases and more often in Europe the trailer light will be connected using a 13 pin plug and socket. If you have a 13 pin socket fitted to your vehicle, adaptors to plug in so you can use a normal 7 pin plug are available. The table and diagram below explains the connections used on a 7 pin setup.